There may be times when you need to prepare a credit memo with QuickBooks 2015. Credit memos can be a handy way to fix data-entry mistakes that you didn’t find or correct earlier. Credit memos are also handy ways to handle things like customer returns and refunds. If you’ve prepared an invoice before, you’ll find that preparing a QuickBooks credit memo is a lot easier than using old-fashioned methods. The following steps describe how to create the most complicated and involved kind of credit memo: a product credit memo. Creating a service or professional credit memo works basically the same way, however. You just fill in fewer fields. Choose Customers→Create Credit Memos/Refunds or click the Refunds & Credits icon in the Customer section of the Home page to display the Create Credit Memos/Refunds window. Identify the customer and, if necessary, the job in the Customer: Job drop-down list. You can select the customer or job from the list by clicking it. (Optional) Specify a class for the credit memo. If you’re using classes to categorize transactions, activate the Class drop-down list and choose the appropriate class for the credit memo. Press Tab to move the cursor to the Date text box. Then enter the correct date in MM/DD/YYYY format. (Optional) Enter a credit memo number. QuickBooks suggests a credit memo number by adding 1 to the last credit memo number you used. You can accept the number or tab to the Credit No. text box to change the number to whatever you want. Fix the Customer address, if necessary. QuickBooks grabs the billing address from the Customer list. You can change the address for the credit memo by replacing some portion of the usual billing address. Typically, you should use the same address for the credit memo that you use for the original invoice or invoices. (Optional … sort of) Provide the purchase order (PO) number. If the credit memo adjusts the total remaining balance on a customer purchase order, you should probably enter the number of the purchase order into the P.O. No. text box. Here’s some logic on this suggestion, for those readers who care: If you billed your customer $1,000 on P.O. No. 1984, which authorizes a $1,000 purchase, you used up the entire purchase order — at least according to the customer’s accounts payable clerk, who processes your invoices. If you make sure that a credit memo for $1,000 is identified as being related to P.O. No. 1984, however, you essentially free up the $1,000 purchase balance, which might mean that you can use, or bill on, the purchase order again. If the customer returns items, describe each item. Move the cursor to the first row of the Item/Description/Tax/Qty/Rate/Amount text box. In the first empty row of the box, activate the Item drop-down list and then select the item. After you select it, QuickBooks fills in the Description and Rate text boxes with whatever sales description and sales price you entered in the Item list. Enter the number of items that the customer is returning in the Qty text box. Enter each item that the customer is returning by filling in the empty rows of the list box. In the case of inventory items, QuickBooks assumes that the items you’re showing on a credit memo are returned to inventory. You want to adjust your inventory physical counts if unsold items are returned. As with invoices, you can put as many items on a credit memo as you want. Describe any special items that the credit memo should include. If you want to issue a credit memo for other items that appear on the original invoice — freight, discounts, other charges, and so on — add descriptions of each item to the Item list. To add descriptions of these items, activate the Item drop-down list of the next empty row and then select the special item. After QuickBooks fills in the Description and Rate text boxes, edit this information. Enter each special item — subtotal, discount, freight, and so on — that you’re itemizing on the credit memo. If you want to include a Discount item, you need to stick a Subtotal item on the credit memo after the inventory or other items that you’ve discounted. Then stick a Discount item directly after the Subtotal item. In this way, QuickBooks calculates the discount as a percentage of the subtotal. (Optional) Add a customer message. Activate the Customer Message list and select a clever customer message. Move the cursor to the Tax list box, activate the list box, and then select the correct sales tax. You can use the Memo text box to add a memo description to the credit memo. For example, you might use this description to explain your reasons for issuing the credit memo and to cross-reference the original invoice or invoices. Note that the Memo field prints on the Customer Statement. If you want to delay printing this credit memo, select the Print Later check box. To save a completed credit memo, click either the Save & New or Save & Close button. QuickBooks then displays a dialog box that asks what you want to do with the credit memo: Retain the credit, give a refund, or apply the credit to an invoice. Make your choice by clicking the button that corresponds to what you want to do. If you choose Apply to Invoice, QuickBooks asks for some additional information. 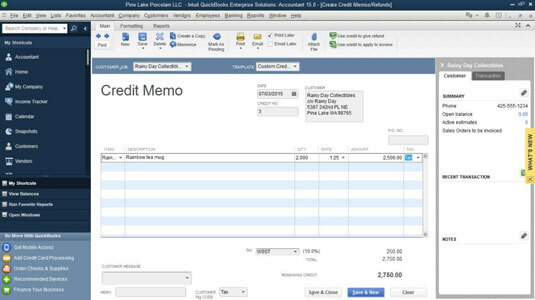 QuickBooks then saves the credit memo that’s onscreen and, if you clicked Save & New, displays an empty Create Credit Memos/Refunds window so that you can create another credit memo. When you’re done creating credit memos, you can click the credit memo form’s Close button.